This is the bottom end of Penny St, looking down towards Salford at the very bottom, with a glimpse of Railway Rd (where the bus is emerging from). 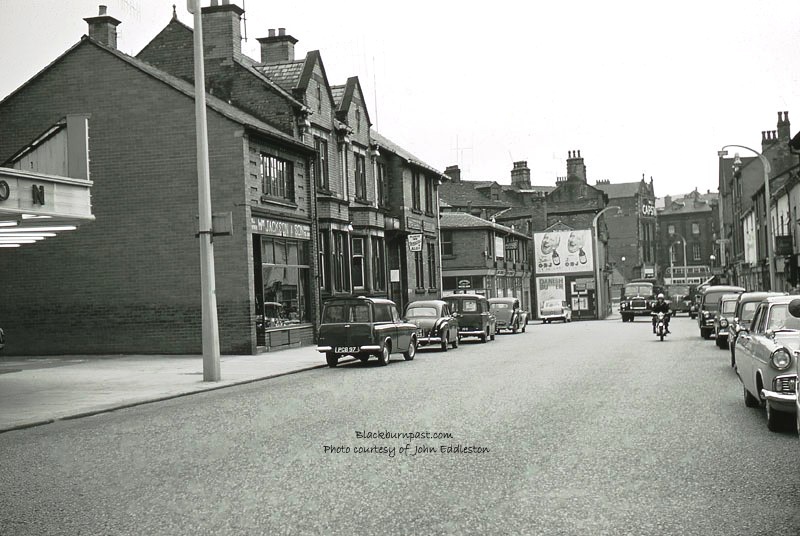 On the left of the photo you can see a little bit of the canopy over the entrance to the Odeon cinema and just past the Fleece pub, is the junction of Starkie St. Note the Dutton's OBJ advertisement on the gable facing us. Quite a popular drink back then, in their dumpy little half pint bottles. The Dutton's brewery is just out of sight, to the left around the corner at the bottom, as is their pub, the Lord Nelson, which had the illuminated OBJ man on it. When was The Fleece built? I wonder if it will survive the redevelopments of that area? I believe The Fleece dates to the late 1920's or early 1930's. It replaced an earlier Fleece that was on the same plot. I haven't seen much in the way of plans for that area, but have read about the proposed new bus station and the rumoured plan for a large supermarket (like we need another) on the Thwaites site, when they move out. Personally, I can't see it surviving if both go ahead. Only time will tell.